With the 95 plus degree days we been having, a summer salad is one of the main things on our menu. 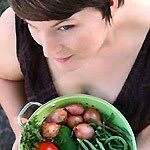 Plus it is quick, which is important now that most of my cooking happens in 10 minute increments while holding a baby. Pan Roasted Beets, Peaches and Goat Cheese Salad is one of my favorites and a great way to show case beets. 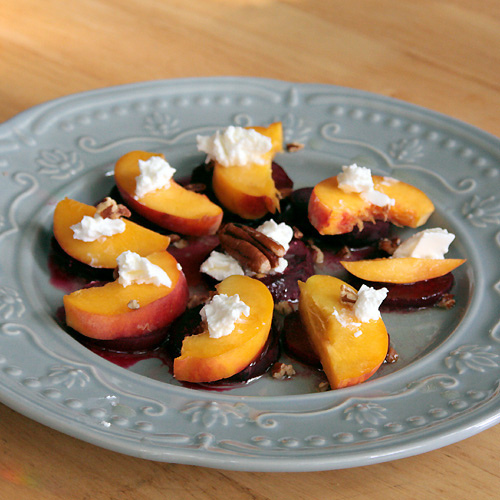 Their simple earthy flavor and bold cranberry color make an unexpected and beautiful combination with tart peaches and creamy goat cheese. This is an excellent lunch or make smaller portions for an appetizer. My recipe was inspired by a similar dish I ordered at Lucrezia Cafe after a visit to the Chesterton European Market in north west Indiana. If you ever find yourself in the neighborhood you should go to the Saturday market and then eat at Lucrezia's. It's one of the things I miss most about living in Valparaiso. Peel and slice the beets into half inch thick coins. Then over medium heat cook them until fork tender in a dash of olive oil; about 15-20 minutes. Arrange the beets onto plates. A light colored plate is a must to show off the beautiful colors of this salad. For the dressing in a small bowl whisk to combine the citrus juice, olive oil and pinch of salt. Then drizzle over the beets. The color of the beets will bleed into the dressing. Cut the peaches into wedges place on top of the beets. Dab goat cheese onto each peach. I wouldn't blame you if you used more than 1 oz of goat cheese per person. Sprinkle the toasted pecans over top. Serve chilled or at room temperature and enjoy! I love all the flavors in this dish. Looks amazing! The colors are beautifully, especially on that plate!